It's rather difficult to explain what exactly happened to me last Sunday morning in the middle of our service at church. I didn't come in with a particularly heavy heart. I'd had a good morning and wasn't frustrated. I was happy to be in the Lord's house and was excited to hear our Pastor bring the Word. I expected to be ushered into a beautiful time of praise via our worship band and I expected to be challenged during the message. What I did not expect was the spiritual drenching I received from the first chord of the first song to the last drum beat of the final song and on throughout the remainder of the day. Out of nowhere, the tears came. With each song, I felt something different being spoken to my spirit. We sang "This is Amazing Grace" and I was overwhelmed by the fact that I receive an amazing grace that I can never do anything to deserve. With "For the Cross" I broke down over the sacrifice my Savior made for me - my death that He took upon Himself. With a Fuel original called "Jesus We Adore You" I was brought back to that idea of Jesus being my first love. I remember thinking most girls have the ability to say that their daddy was their first love but I didn't have that. I had it better. Because my Heavenly Daddy, my Savior, truly was my first love. But perhaps the song that resonated with me most and has been speaking to me all week, was "Ever Be." This song has been my praise this week. But as I sang it (through tears and snot) on Sunday, it hit me. If His praise is always on my lips, then there isn't room for other stuff. I wouldn't have room to complain or grumble. I wouldn't have room to gossip. I wouldn't have room to speak any type of negativity. If His praise is ever on my lips, then none of that other stuff can seep out. And so, that is my goal. 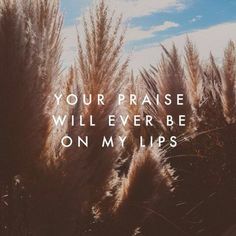 My goal is to have His praise always on my lips, whether it be in the form of gratitude or encouragement or positive words...somehow, some way, I will strive to always be praising Him. If His praise is in my heart constantly, then everything I say and do will be filtered through that...and I can think of no better way to live this life. I'm not going to get it right every day. But at least it's a reminder I can give myself when I find myself faltering. Lord, help me to ever be...praising YOU.